There’s nothing like letting 5 kids loose on 4 bins packed with exciting things they haven’t seen for a full year. Add to that thousands of messy pine needles all over the carpet (I swear they are ALL over the house!) and all of the poorly-placed ornaments that ended up on the ground over night (don’t you love the branches that have 5 ornaments hanging on them??). So this morning after the kids got off to school, I turned the Christmas music on loud and got to work. One of my best toy purchases ever. Twizzler talks about this all year long (“Mom, why can’t we play with the manger set ALL the time?”). With 10 minutes left before he needed to walk out the door this morning, I had to peel Twizzler away from the Playmobil. He LOoOoOves it! It’s not ideal for houses with babies. Lots of teeny tiny pieces. But it’s Oh-so-good for the bigger kids. Lots of hands on. My mom made this nativity for me the year that KitKat was born, which I suppose makes it our very first (and therefore, oldest) Nativity. 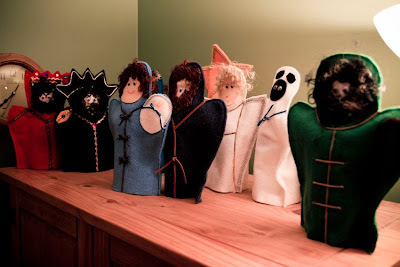 Only problem I have with this set is that I let kids play with the puppets early on, and now I am paranoid about little fingers pulling and stretching. So they stay up high, supported by water bottles and an occasional bottle of ketchup. Isn’t this so cute?! 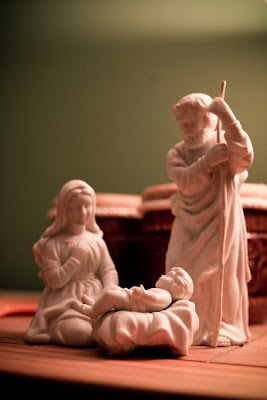 I love this simple, white porcelain 3 piece Nativity. It’s our second oldest set and it’s not in great shape (Mary needs to be re-glued) but it’s a classic. My kids are ALMOST too big for Little People, but I have always LOVED them. I couldn’t resist their Nativity. 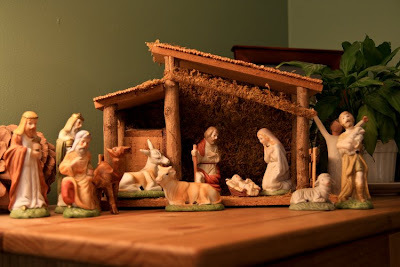 Out of all of my Nativities, this one is the most durable and kid-friendly. It has a prominent place on the side table next to the Christmas tree. 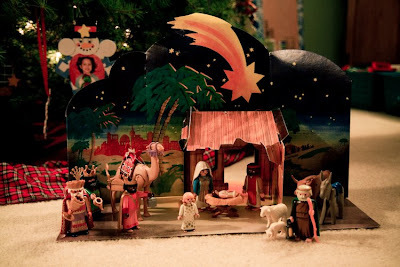 The stable plays “Away in a Manger.” AlmondJoy kept rearranging the pieces so that they’d match the picture on the box. 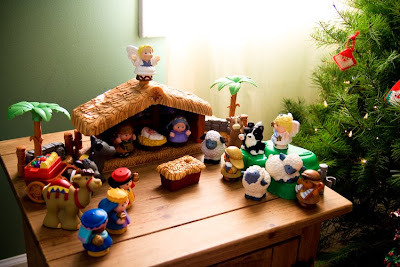 Someday, Al’s children will play with this Nativity when they visit Grandma’s house (will I really be a Grandma someday?!) because I plan on keeping this one forever! I found my newest nativity during our stop in Honduras during last year’s cruise. 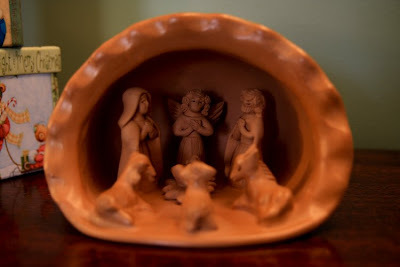 I was so worried that the clay nativity would not survive the trip home, but somehow it did! This is it’s first year on display. I love it!